This recipe was adapted from Chosen Foods. Preheat oven to 350 degrees. Mix first three ingredients together and stir well. Add remaining ingredients and whisk together just until combined. Set batter aside. Spray a loaf pan with preservative free cooking spray. (I prefer Chosen Foods avocado oil spray) then add a few tsp coconut flour and shake the pan to coat. Dump out extra flour from pan. Pour batter into floured pan. Using the back of a spoon, press batter down and spread out. Bake for 30-35 minutes. Enjoy!! 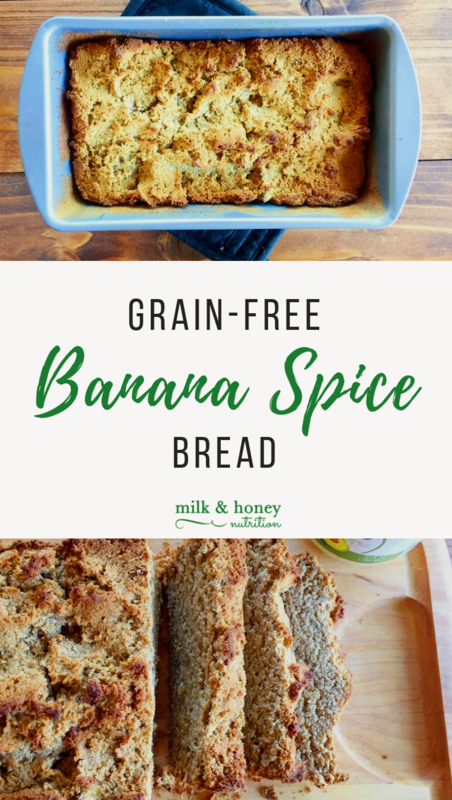 *To make Grain Free PUMPKIN Banana Spice Bread, substitute 1/2 of the avocado oil mayonnaise for pumpkin puree (so you'll use 1/2 cup mayo and 1/2 cup pumpkin).